A nasally w-a-a-a-a-a-h reminiscent of a bawling calf explodes across the desert night. The horsetails ruffle. Seconds later a piercing cry screams to the stars. The grass moves and a Woodhouse's toad jumps toward the slow moving water. The sun is setting. The smell of musky marsh permeates the cool night and I expect a dinosaur to step out of the brush. Fossil records show early frogs shared the forests in the Jurassic Period with dinosaurs. The lineage of the toad is not clear, yet it can be traced back to primitive fish named Ichtyhostegalia. I spot the Woodhouse's toad. The 4-inch long toad moves slowly and continuously, attempting to get out of my reach. The beauty of the wrinkled gray-green skin intrigues me. I lie on the ground and watch the heart beating under the throat, regularly, like a drum, offsetting the bulging white eyes above. I gaze into the toad's eyes and meet an ancestral stare; then he hops away. Breeding season is underway. Unlike frogs, toads deposit a string of eggs surrounded by a single jelly-like envelope. Each inch of string holds 17 to 25 eggs. The fertilized eggs soon develop into tadpoles, and the large-headed polliwogs filter-feed upon decaying plant matter. Removal of this material increases the amount of oxygen in the water and prolongs the life of the pond. Continuing the life cycle, hind legs grow on the tadpole. Then the front legs grow under the skin and burst through. Lungs replace the gills, and finally, the tail is absorbed and the adult stage begins. Only at the adult stage can toads live without water. Desiccation at any previous stage proves fatal. For four more years this Woodhouse's toad will bellow like a screaming calf in the twilight of spring evenings. I will seek him out to remind myself of the mysteries of ancient cycles. Occurs in the Intermountain West and Central states of North America into Northern Mexico and from the Atlantic Coast westward. Wooded bottomlands, mountain canyons, riverbanks, marshes, irrigated farmland, gardens and residential areas. Generally found below 7,000 feet in elevation. One of the few toads to be seen around homes. 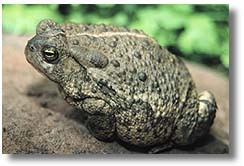 Woodhouse's toads grow 2 to 5 inches long, with a thick head, rounded snout and wide waist (looks like a hockey puck). Hind legs are short. Body color is grayish- or yellowish-brown with a prominent white stripe down the back. Woodhouse's have warty skins, horizontal pupils, large neck glands (also called the parotoid gland), lack upper row of teeth and have prominent bony ridges just behind their eyes. 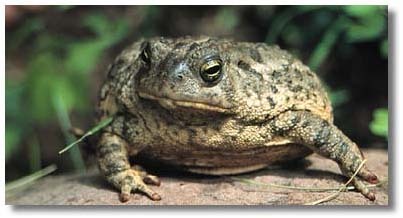 The glands and warts produce a poison -- bufotalin, bufonin or bufogin -- that makes the toad bad to eat. They won't give you warts! Predators are raccoons, skunks, snakes, herons and fish (eat the tadpoles). 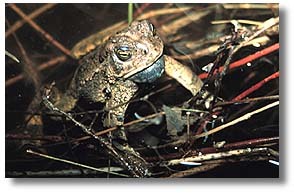 Woodhouse's toads are active at night but can be seen in the daytime. The young toads, which are small, may be easily seen in the daytime. Otherwise, the toads burrow into the soil beneath low mounds or hide in debris piles. The toads may hop short distances; they are not great leapers like some frogs. Toads hibernate in winter by burrowing into soft ground or going under debris piles. Because they have microscopic mucous glands, which keeps their tight skin moist, Woodhouse's toads may be seen away from water. Males have a dark throat and vocal sac that they use during the breeding season. The sac expands like a balloon and helps to resonate the "sheep-like" bleat of the chorusing male. The call or chorus is 4 to 10 seconds long and is a long trill that sounds like "waa-a-a-a-a-ah." Only males call. The males gather at small pools in the spring (April-June) and call to attract females to mate.. These toads mate in the water. Females lay long strings of eggs as they walk or swim around the pools. The eggs are laid in one or two rows and are covered with a single continuous jelly envelope to protect the eggs from drying out. The strings of eggs may cross over themselves many times; they may or may not be anchored to aquatic plants. The life span of the Woodhouse's toad is unknown. There are four subspecies of the Woodhouse's toad recognized.